Biwa Lake boasts a number of superlatives. To the casual observer it is readily apparent that freshwater ‘Biwa-ko’ (琵琶湖) is the largest lake in Japan. With a surface area of 670.3 km² this lake comprises a full sixth of its home turf, Shiga Prefecture. Biwa is also Japan’s oldest lake, and with estimates putting its birthday somewhere between four and six million years ago it is considered one of the oldest lakes in the world. That Lake Biwa is fed by one hundred and twenty rivers running down from the surrounding mountains may be another record but official information is lacking. The area around Lake Biwa was at one time referred to as Omi. Situated alongside the country's long-time political center of Kyoto, the Omi district was an important transportation hub, particularly for rice coming from the further eastern regions. With the Meiji Restoration of 1868 and the transfer of the capital to Tokyo, the political and economic fortunes of Kyoto, and in turn Omi and Biwa-ko, sharply declined. Refusing to take this development lying down, the remaining local population began work on the Lake Biwa Canal (the ‘Biwako-Sosui’ – 琵琶湖疏水,). This Meiji Period project connected the area around Ōtsu City’s Mii-dera in Shiga with the Nanzen-ji area in Kyoto via manmade tunnels running under Daimonji-yama and on to its terminus near Nanzen-ji in Kyoto. This canal opened up a new and efficient route for transporting water, goods and people between Lake Biwa and Kyoto while making possible Japan's first public hydroelectric power generator, which from 1895 provided electricity to power Kyoto's tram system. Designated an Historic Site in 1996, the canal’s primary function is now to provide Kyoto and the greater Kansai Region with water for drinking, as well as for fire-fighting and irrigation purposes. A note of interest to visitors: To compensate for a 36-meter drop from Mii-dera to Nanzen-ji an inclined plane was constructed, allowing boats to travel one stretch of the trip on land by being placed on a flat car. Operation of this incline track came to an end in 1948 but sections have been preserved and can be seen up close today, the aging structures contrasting in Spring with the cherry tree blossoms overhead. Biwako puts on a variety of faces as you travel around her 235-kilometer shoreline. Her southernmost edges are dominated by the cities of Ōtsu and Kusatsu, though it is a short trip into the mountains cradling the area. 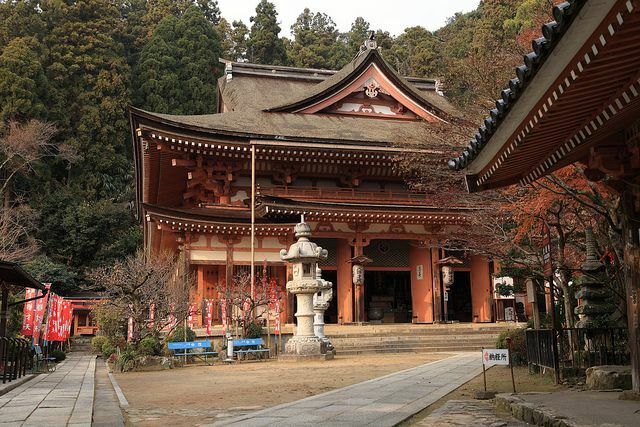 One possibility is a trip to Oumi-jingu Shrine coupled with a hike up nearby Mt. Hiei, site of Enryaku-ji Temple and the Tendai Sect of Buddhism, founded in 788 AD, as well as the home of the legendary warrior monks who once conducted raids on the city of Kyoto. Along Biwa’s western shore you’ll find picturesque Shirahige Shrine and, just up the road, the Shirohigehama-suiei (白ひげ浜水泳) beach and campground. Across the water lies Hikone, the largest town on Biwa’s eastern shore with a population of 113,000. Hikone is best known for its eponymous castle, one of Japan’s handful of remaining originals. Genkyuen Garden, laid out at the feet of Hikone-jo, was the feudal lord’s favorite spot to entertain guests but is now open to us common folk as well. From Hikone Port you can board a boat to one of Biwa’s three islands, including Chikubu-shima, home of Tsukubuma Shrine and Hogon-ji, 30th Temple of the Kannon Temple Pilgrimage. Or invade tiny Okishima Island, the only inhabited lake island in all of Japan. Biwako sports plenty of serene shoreline as well, in many spots adorned with the reed colonies that play an important role in purifying water as well as providing habitat for birds and fish. Biwa also offers cycling paths around most of her perimeter, with plenty of places along the way to eat, rest and sleep, one option for the latter being the Wanihama Seinen Kaikan where, we hear, the old couple running the place will add up your bill with an abacus. How’s that for an authentic Japanese experience? Varied yet concise information on Lake Biwa and her environs can be found courtesy of the Japan National Tourism Office. Check it out and plan your trip! One final and utterly trivial note: As mentioned at the top, Biwako is Japan’s largest lake at 670.3 km2. Japan’s second largest lake is Ibaraki Prefecture’s Kasumigaura, measuring 167.6km2. For a bit of fun, multiply Kasumigaura’s area by four and see what you get!